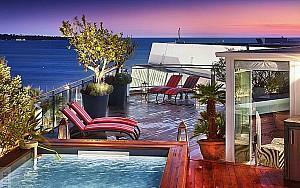 For those want to live life at the top, a penthouse in Cannes is one of the best ways to make sure they do. Located in some of the most sough-after residential areas, the penthouses for sale in Cannes in our portfolio are within few minutes from the city’s famous attractions. 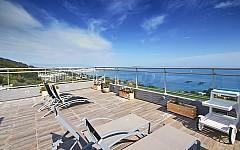 Moreover, many of our top floor apartments for sale Cannes offer unique views over Cannes and the Mediterranean Sea. With large sun-lit rooms and floor-to-ceiling windows, the main advantage of a top floor apartment in Cannes remains the large wrap-around terrace, ideal for cocktails and receptions. One can feel the call of the city and the breeze of the sea nearby while relaxing on the terrace. Our offer also includes exclusive penthouses for sale in Cannes with indoor pools, gym and sauna, barbeque areas and other premium amenities. The PALM REAL ESTATE selection of penthouses for sale in Cannes addresses both those who want to live in the centre, as well as those who prefer a private and quiet neighbourhood. The first can choose a top floor apartment in Cannes at a walking distance from the famous La Croisette, or Rue d’Antibes, while the latter will enjoy the tranquility of exclusive residential areas such as Croix des Gardes, or La Californie. As a high-end real estate agency dedicated to distinctive homes on the French Riviera, PALM REAL ESTATE carefully selects quality residences that meet the high standards of our discerning clients. Our expert team, committed to quality beyond luxury, can provide personalised assistance to customers who want to buy high-end properties anywhere in Cannes, Theoule, Mougins, Valbonne, Golfe Jouan and Cap d’Antibes. Contact us when you are looking for a penthouse in Cannes, and we will help you find the property that best suits your needs.